Since the mangrove forest in Quang Loi (Quang Dien, Thua Thien Hue) grew, more and more tourists have come here to visit. The fishermen here have a new job to do, which is ecotourism business. Mr. Tran Van Quang living in Hue City finds it interesting when visiting the mangrove forest in Quang Loi commune. This is the place where he and his friends had come to visit many times; previously, they explored mainly the floating market, and went to Con Toc wharf to enjoy seafood dishes; and now, Mr. Quang and visitors can stroll around the mangrove forest, they can enjoy the landscape, catch fishes, shrimps, and crabs, etc., with traditional tools such as fishing coops, fishing nets, and fish-hooks. Mr. Ha Binh, an officer of Quang Loi Commune People's Committee, said: "Quang Loi commune, which is located along Tam Giang lagoon, often suffers severe consequences in the northeast monsoon season. Since the mangrove forest was planted in the lagoon area by the Provincial Forest Protection Department, with an area of more than 50 hectares including cork trees and water coconut trees; it has not only contributed to protecting the dyke and irrigation systems, as well as crops, but also opened the opportunities to develop community ecotourism in the locality." 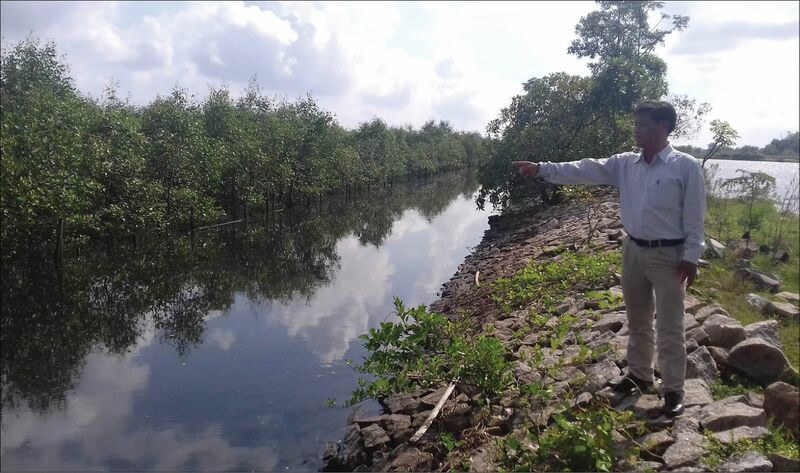 The growing mangrove forest is the "salvation" in economic development, as expected by the people of Quang Loi commune, especially Ngu My Thanh hamlet. When people first started planting the forest, they did not really believe in its positive effects. Now that the goals are very clear when the forest grows. In recent storms and floods, the systems of dykes and irrigation in Quang Loi commune area have been protected safely. One thing that the locals had expected and now become real is that the forest has attracted more and more tourists to visit and explore. The vast mangrove forest becomes a "landing zone" for flocks of storks. In the early mornings or late afternoons, tourists can watch the flocks of white storks hovering over the forest, which is a beautiful spectacle. The mangrove forest is also an ideal habitat for many kinds of shrimps, crabs, and fishes. Visitors coming here can not only admire the traditional crafts of fishermen, but also freely experience themselves the traditional crafts of catching fishes and shrimps in the locality, such as using fishing coops, fishing nets, and fish-hooks, etc. From Con Toc wharf, after strolling around, and enjoying the mangrove forest on boats with interesting fishing activities. Tourists can come to the floating market to explore the life, and seafood trading activities of fishermen in Tam Giang lagoon. When coming to the floating market, tourists can buy baskets of fresh fishes and shrimps, and then process their own dishes right away on the boats hired from the fishermen. Therefore, in addition to the craft of fishing, the fishermen now serve boat rental service that provides them a significant source of income. Tourists often rent boats by hour, or by day, which usually costs VND 200,000 per hour, and about VND 1 million for a whole day, including fuel costs. Mr. Bui Lanh, Chairman of Quang Loi Commune People's Committee, stated an idea that in the coming time, Quang Loi Commune People's Committee would call for organizations and individuals to invest in the construction of floating restaurants on the lagoon, or restaurants in stilt houses surrounding the mangrove forest, so as to bring to tourists the rustic dishes after strolling around the mangrove forest. In these restaurants, local fishermen would serve rustic seafood dishes of Tam Giang lagoon area. In Con Toc area, there are already a number of guesthouses, or locals’ houses, which can provide accommodation services for tourists after a day traveling the lagoon. After discovering the mangrove forest, Con Toc wharf, or Con Me area, tourists can go to the bird sanctuary in Tam Giang lagoon which is being restored; and go to a shrine where fishermen pray for favorable conditions, which is restored by the district so as to put into the tour. From Con Toc wharf, tourists can travel to Quang Ngan and Quang Cong beaches. From there, they can rent bicycles, have fun, enjoy the picturesque landscape, and discover the life and culture of fishermen in the lagoon and coastal areas. When coming to the coastal area, tourists can rent canoes and fishing gear to experience the craft of dragging "dragon nets" in the morning, or at night. There are about 200 households living in Ngu My Thanh hamlet, mainly engaged in fishing and aquaculture in Tam Giang lagoon. Besides the fishing craft, many fishermen households do one more job, namely “tourism”, which is mainly to provide boat rental services, and fishing gear, etc. On average, many households could earn an additional daily income of VND 200-500 thousand from renting boats, and fishing gear as well as selling seafood to tourists.